Egypt is a transcontinental country spanning the northeast corner of Africa and southwest corner of Asia by a land bridge formed by the Sinai Peninsula. Being a Mediterranean country, Egypt is not only famous for the majestic pyramids but also for the beauty of the legendary Nile River and its historical and cultural sites. Let’s discover the charm of this Pyramid country before travelling! 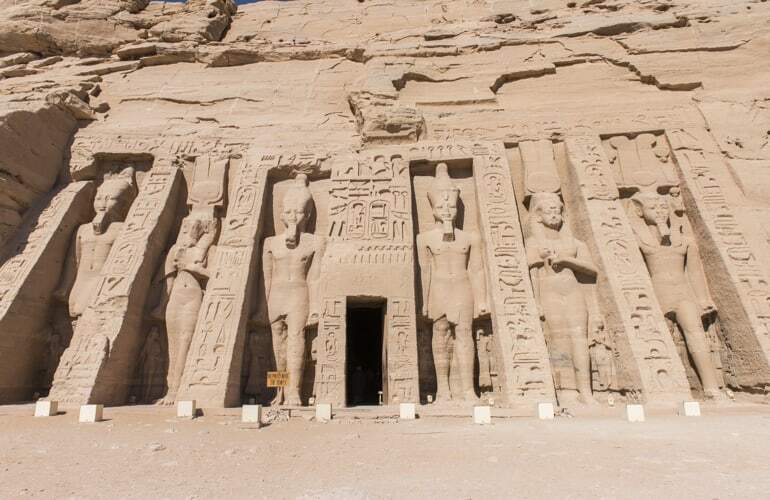 This is one of the most impressive sites of Egypt where you can find the two temples carved into the rock of ancient Egypt, dating back over 30 centuries. Built by Pharaoh Ramses II, this monument is located in the upper Nile Valley, accessible by road, boat or plane. The legend says that the sun was created only for one purpose: to illuminate each morning the four giants statues of the Abu Simbel temple. These four statues are about 20 meters high, delicately hewn into the side of the mountain. Unfortunately one of them is damaged seriously but the temple’s architecture is worth to contemplate. It would be a big missing if you travel to Egypt without visiting its capital - Cairo? This is one of the largest cities in the Middle East and the most populous city in Africa. It might not be a peaceful destination of your journey because of the noise and the crowd, but there are somethings in this city will thrills travelers as a kind of cultural momentum. And for good reason, you will have the opportunity to visit one of the largest museums in the world devoted to Egyptian antiquity. 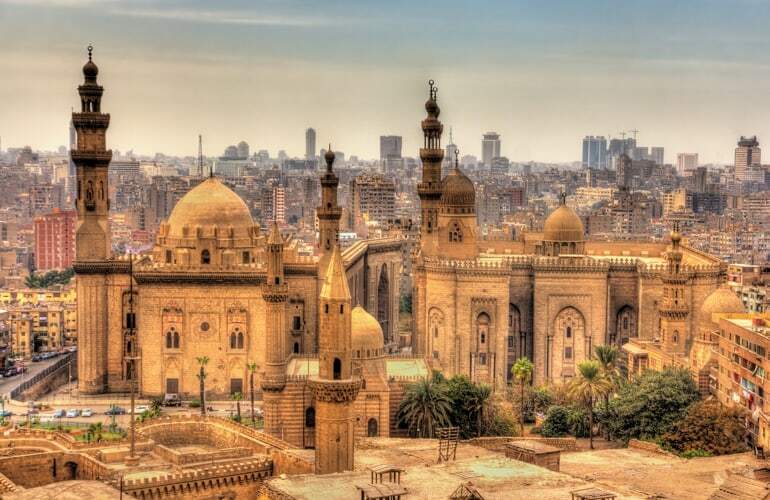 You can also stroll through the alleys of Islamic Cairo where the world famous Khan el-Khalili souk is located and enjoy the gastronomy in tasty restaurants. Finally, take the time to admire the pyramids of Giza before going to the south to admire other cities of the country which are quieter. 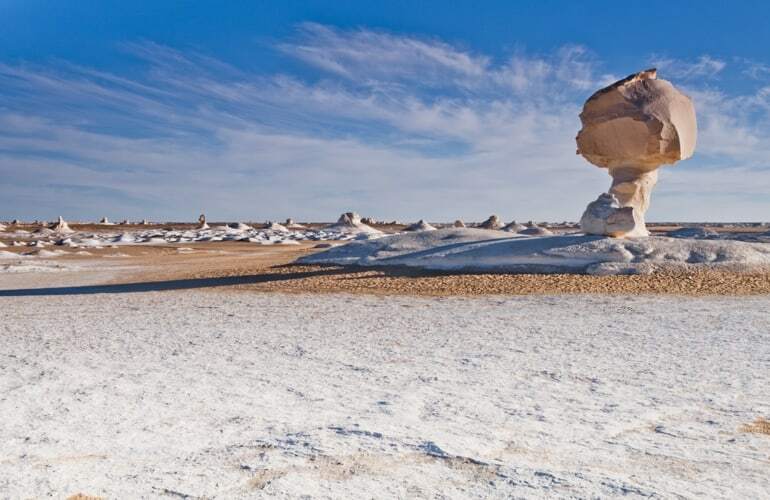 White Desert is a 20 km stretch on both sides of the road between Bahariva and Qasr el Farafra. Especially, the sea was present in this little piece of desert around 70 million years ago. Then, it deposited limestone and chalk on the original sandstone. This unique landscape was shaped by the wind and the rain on these sandstones. A rare thing is that the sea has also left sea urchins imprisoned in the rock as well as massive corals. You should make a trek of a few days in order to truly admire this beautiful phenomenon of nature. Of course, do not miss the sumptuous Luxor on the banks of the Nile in the south of the country. Luxor is the tourist city of Egypt because it contains the largest number of monuments and ancient remains. The ideal is to stay here 2 or 3 days in order to be able to get the full view as it should! First, join the religious complex of Karnak with its ruins of temples, chapels and pylons on the east bank of the Nile River. This is the most visited place in Egypt. 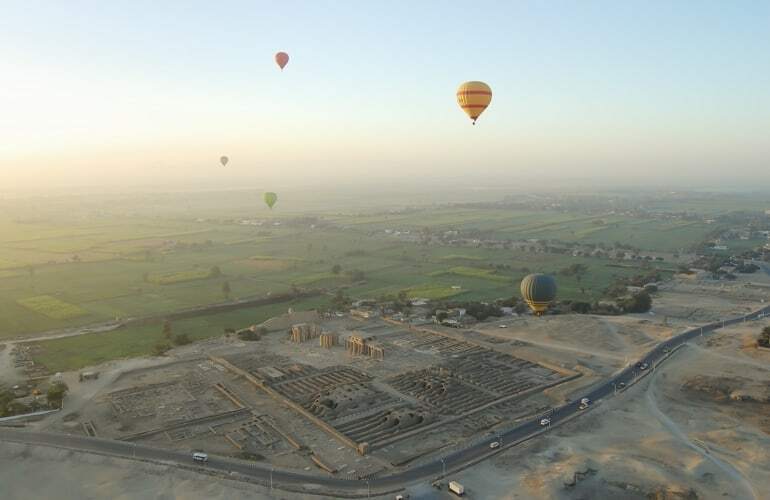 Next, you can visit the Valley of the Kings, the Valley of the Queens, the Valley of the Artists, the temple of Hatshepsut ... And finally, relax while taking a walk through Felucca ride on the Nile or enjoy the view of this charming city by hot air balloon. Egypt is not only sand and pyramids! There are also beautiful calm beaches with clear waters. Famous for its diving sites such as Ras Mohamed and Ras Nasrani, Sharm El Sheikh is located at the southern tip of the Sinai desert, offering the sumptuous desert landscapes of the Red Sea. In the heart of the city, you will dive into authentic Egypt by eating typical dishes, stroll through the souks and relax on the shisha terraces. Located at 680 km from Cairo to the south, Aswan is the smallest among three major tourist cities on the Nile. The weather here is quite dry and hot. Traveling to this city, you will have the opportunity to see the Nile crocodiles. 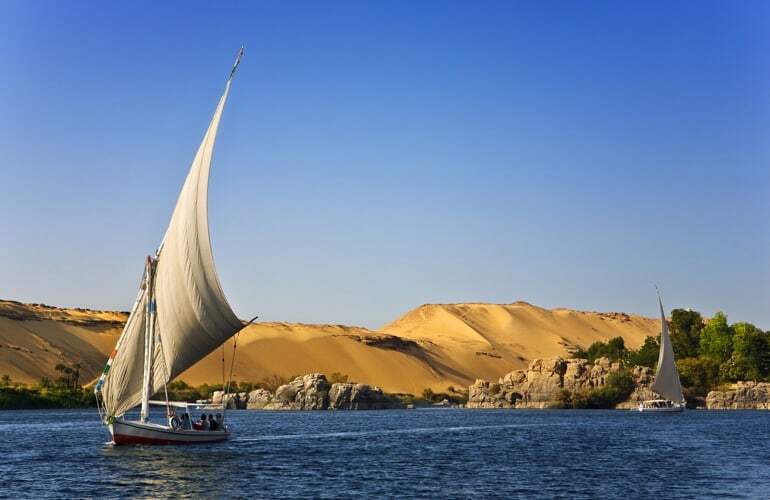 In addition, you can also experience travel activities such as take a camel ride along the banks of the Nile; visite many historical, cultural and architectural relics and admire the spectacular dams up to 111 meters high. It will be a memorable experience for you. 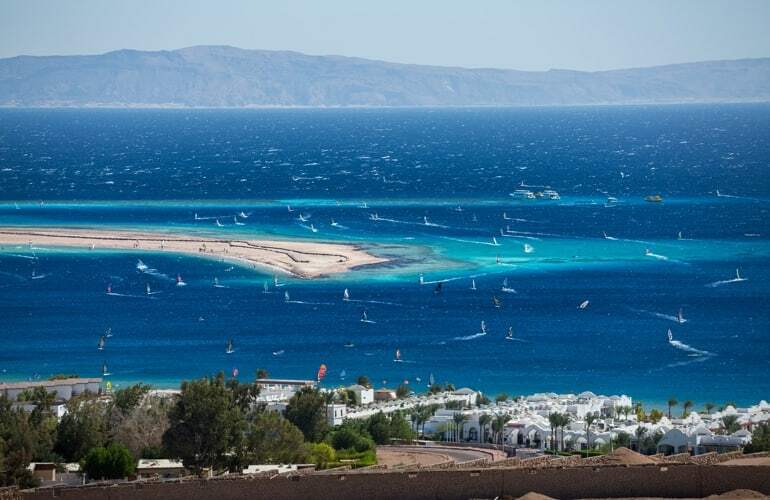 Situated at 80 km north of Sharm el-Sheikh, Dahab is a popular tourist destination with unspoiled scenery, vast mountains, and beautiful beaches. It is an ideal destination for those who love diving tourism.